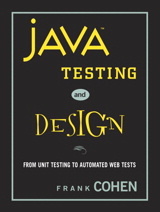 Java Testing and Design: From Unit Testing to Automated Web Tests teaches you a fast and efficient method to build production-worthy, scalable, and well performing Web-enabled applications. The techniques, methodology, and tools presented in this book will enable developers, QA technicians, and IT managers to work together to achieve unprecedented productivity in development and test automation. With Java Testing and Design, you will be prepared for a laundry list of new APIs, protocols, and tools being packed into the next generation of J2EE, .NET, and open-source systems. While these new software libraries, tools, and techniques are a big move forward for all of us, they push us to learn even more technology to turn out complex, highly functional, and interoperable software applications. FRANK COHEN is the "go to" guy when enterprises need to understand and solve problems in complex interoperating information systems, especially Web Services. Frank is Founder of PushToTest, a test automation solutions business, and maintainer of the popular TestMaker open-source project. For the past 25 years he has led some of the software industry's most successful products, including Norton Utilities for the Macintosh, Stacker, and SoftWindows.